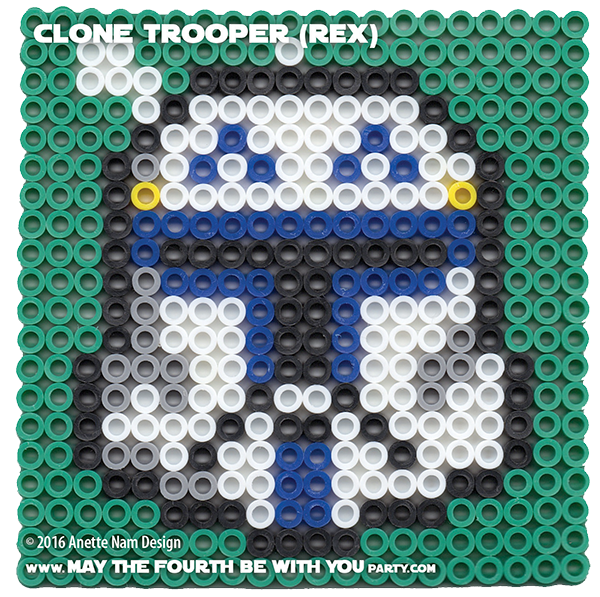 Just like Finn put a face and a personality to stormtroopers, Rex changed how we saw clone troopers. Instead of just another sheep (speaking of cloning…), blindly following orders, we get to know him. We see his struggles trying to figure out what his place is in the clone army, how to be a leader, and his decision to eventually rebel by removing his “inhibitor chip”. Question to all you readers: As you know I have all posts sorted by character name AND type of project. 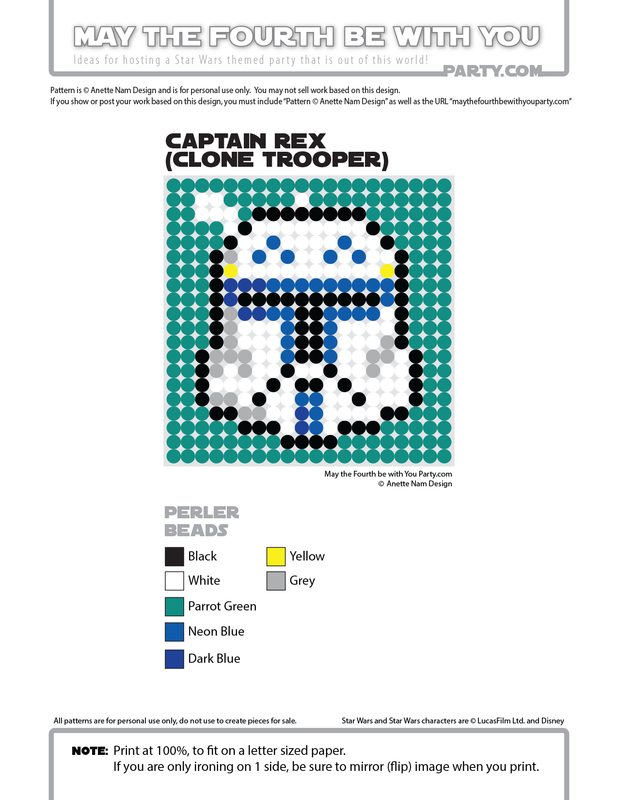 Should I put “Clone Trooper” under “Good Guys and Gals” or “Bad Guys and Gals”? Needless to say, I have Rex under “Good Guys”, but I wasn’t sure what to do with the clone army as a whole. Seeing Rex alive and well in Rebels was such a welcome surprise! It inspired us to make our pixel Rex pattern. We also made a pattern of him from Rebels, and I promise we will post that when we start our Rebels series of patterns. Until then here is #52 in the Perler bead/cross stitch/crochet/knitting/Lego/pixel/mosaic pattern series. I know, that is why I couldn’t decide. They do a lot of good for a long time, then one “little” transmission, and WHAM! Also, I have been told the coasters work with the Darth Pop and the Cloud City Float (Punch) too, so you might want to try those as well. Create a new category for clones: Grey(or Gray) Area Characters. Clone Troopers, Asajj, even Watto should be under this category. They’re not heroes but their not total monsters either and some of them forge their own paths. Does anyone else have thoughts on the “Grey” character category? I just used Watto as an example because even though he’s a slave owner and a bit of a jerk, he at least helps Anakin find his mother. Asajj, though, is what I like to call “The Catwoman of Star Wars” because of her tragic, checkered history from padawan to sith assassin to bounty hunter yet in one CW episode she saves a young woman from an enslaved arranged marriage. I like your thinking! I TOTALLY know what you are talking about. They are both great examples of characters that are more victims of their circumstance than being seduced by the dark side.